When practice started in late July for the Bridgeport High School football team, Coach John Cole was likely breathing a sigh of relief. The second-year coach had managed to do a pretty hefty coaching staff makeover and everything was in place. “Let’s just say it was hectic,” said Cole. Cole had to replace Jason Nicewarner who stepped down after several years with the club as both offensive and defensive coordinator. Assistant coach Brett Hathaway opted to take a position at South Harrison. And as promised, Robert “Bobby” Marra’s pledge to help out one year as a volunteer assistant coach saw its sunset as well. By the time the first whistle was blown July 30, all was in order. A few weeks later, that changed when first-year Coach Casey Stewart left and Cole, again, found himself needing to fill a spot. Filling positions with quality individuals isn’t easy in the offseason. Filling positions in August when the season has begun is an entirely different animal. The first move was to make volunteer coach Sean Snider an interim full-time assistant coach. That left a volunteer spot open. As it turns out, the Indians may have hit a home run. That face on the sideline before games gets started that some may know and some may not know belongs to Jed Reed. 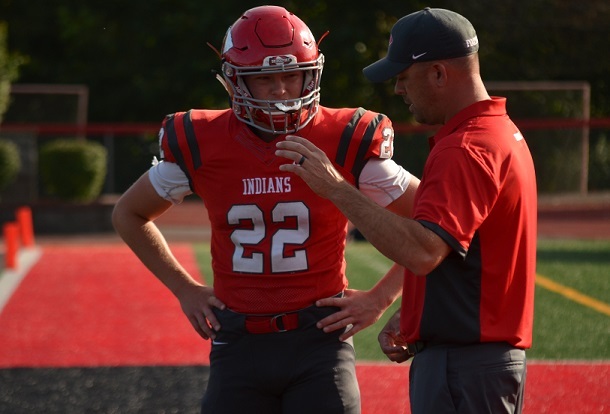 Reed will serve out the year as the Indians’ volunteer assistant and he’s got one heck of a resume to his credit. 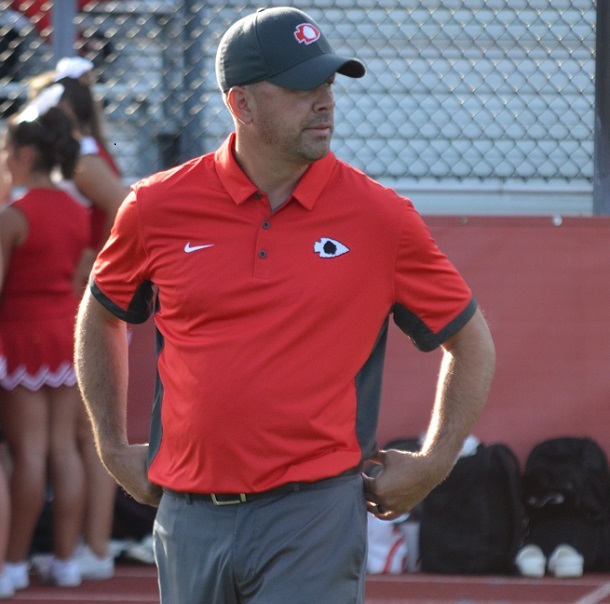 “You can tell he can coach, but right now he’s still getting somewhat familiar with the kids and how the community interacts with the program,” said Cole. “You can tell he’s been a teacher and he’s coached before by how he works with the kids. Getting someone familiar with the community and kids in the community. He seems like a teacher. Reed will be handling duties in the secondary. He’ll serve as the defensive backs coach and is good to go after getting the pre-certifications from the WVSSAC required to fill the spot. Considering his background, that may have been the most difficult part of getting on the BHS sideline. Want some impressive credentials f or a volunteer? Here’s what Reed – a native of Wheeling and a Wheeling Park graduate – has to offer. Reed is a native of Wheeling, WV and is a graduate of Wheeling Park High School where he played for the Patriots. He was good enough that he played at Fairmont State and was a four-year letter winner and a three-year starter while serving as captain his junior and senior seasons. For good measure, he was an all-West Virginia Conference selection twice as a defensive back. As for coaching, he’s pretty well rounded there as well. 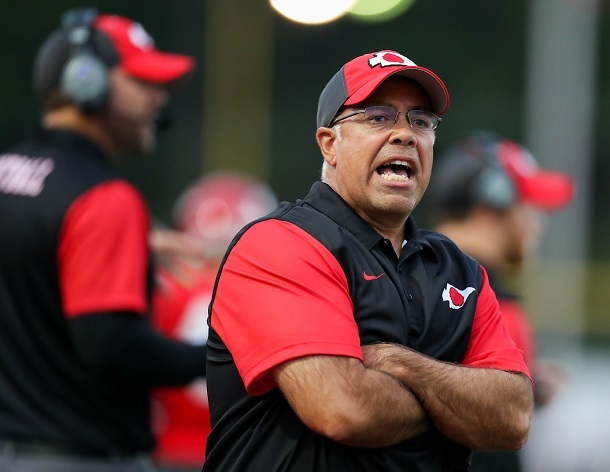 He coached defensive backs at Fairmont State and then was an assistant coach at ZB Vance High School in Charlotte, NC, for two years with the last being in 2003. The difference between coaching at those stops and at Bridgeport? Reed didn’t just arrive late to the team, he’s back after being out of coaching since 2004. He’s comfortably moved into the private sector and is a principal partner and owner of Precision Outdoor Insurance, which is a unique line of insurance offered by his company in all 50 states. For the last four years, Reed has lived in Bridgeport. Even before that, however, he’s had thoughts of coaching again. He just wanted to make sure it was right. Cole pointed out that King and Reed know one another. 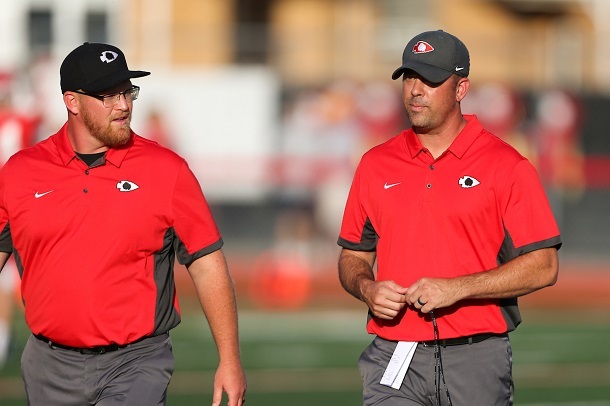 Now, they’re coaching together on the defensive side of the ball. Cole is looking forward to having him. The team concept is important. It’s one of the big reasons the Indians have nine state titles to their credit. I’m sure Reed is hoping to do his part to add one more to the list. 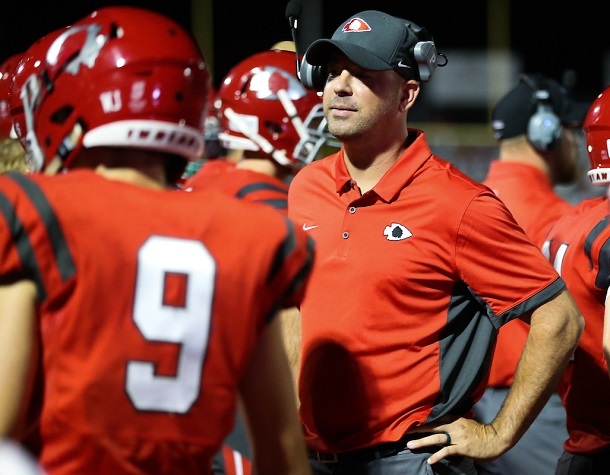 Editor's Note: Top four photos show Coach Jedd Reed with Jake Bowen in the second photo, on the sidelines in the third and with defensive coordinator Adam King in the fourth. Bottom picture is of Coach John Cole. The second, fourth and fifth photos are by www.benqueenphotography.com.